Alumni from 1974 share with the School their wide range of careers since graduating 40 years ago! 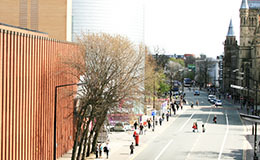 "Professor Jim Miles asked a group of us for career profiles to illustrate some of the outcomes and benefits of a computing degree at Manchester. Remember we are the rebellious generation who did our Sixth Form in the 1960s and witnessed a potential Student Union President dance his way on stage all through 3 minutes and 27 seconds version of Steppenwolf’s “Born to be Wild” during the presidential debate. So rather than give a series of individual career profiles, the Manchester Computation Class of 1973 (That’s right! 40 YEARS AGO) have decided to prepare a group overview of their careers and life after Manchester. The first point of note is that from an original class of 51 students (of which 25% were women), 27 of us are still in contact, meet regularly and ALWAYS have a great time. 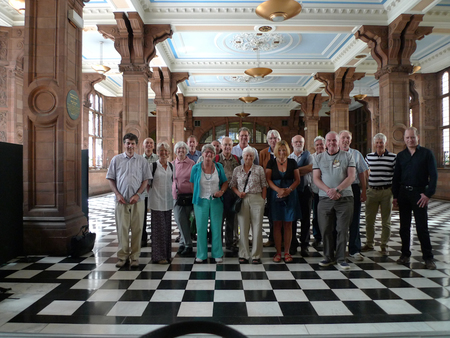 In fact the attached photo shows a number of the group in the Great Hall at the old UMIST Main building in the Northern Campus: a place fondly remembered as a finals exam room. Following graduation the majority, but not all, of this group found jobs in the budding computer industry. We mostly worked for large manufacturers or software houses, writing software and supporting customers. Then as now, Manchester computer graduates were highly sought after. This practical grounding, together with the broad educational background from our course, soon led a number of us to branch out and develop their careers. Some moved into Sales and Marketing, some moved into consulting, a number started their own businesses, many took a career break to raise families; some went into management and one even entered politics! In fact our careers have been so varied that it’s been difficult to find a common thread that might be of interest to undergraduates of today. One moved to Sydney, started a recycling business and now manufactures environmentally friendly paper, embedded with the seeds of Australian plants, so it can be read and then planted! Two provide management consulting at the highest levels of national government, one in London and the other in Wellington, New Zealand. Overall our career spread has been amazing; we have travelled all over the world and generally enjoyed life. So what did our time in Manchester really teach us? Probably the best answer that we could come up with is that our degrees meant that we could do anything that we wanted!"